Vienna is in a class all its own, a cultural feast for the eyes and ears. Take in a concert or art masterpiece in this Old World capital city, so full of beauty and romance. Tour its cathedrals and palaces, take in its countless museums, or relax in one of the city's picture-perfect parks. Stay in a vacation rental apartment in the charming heart of the city. Sights to see: St. Stephen’s Cathedral and catacombs, the Hapsburg summer palace of Schoenbrunn; Belvedere Palace museum and garden, Kunst Haus Wien, and more! Day trips: The romantic Danube castles, abbeys, and villages of the Wachau; the vast grasslands at Lake Neusiedl, with its unique bird habitat and flora; the spa town of Baden; Joseph Haydn’s grave in Eisenstadt; the medieval city of Graz; the Roman ruins at Carnuntum; and even the Slovakian capital, Bratislava. Sightseeing: The catacombs under St. Stephan’s Cathedral; the imperial apartments in the Hofburg, the Hapsburg summer palace of Schoenbrunn; the art museum and gardens of the Belvedere Palace; the world-renowned State Opera House, and some of Vienna’s countless museums. And, of course, what is Vienna without music? The Vienna Boys Choir, the opera houses, concert houses, and churches all feature the best musicians in the world performing for both Viennese and international audiences. Around every corner on a Vienna Untour is an off-the-beaten track delight: Strolling through the historic Prater amusement park; shopping for Austrian antiques at a flea market; buying food at an open-air market; sipping coffee and reading a newspaper in a café frequented by writers, actors, and musicians; eating hot sausage and drinking crisp white wine in a Vienna woods wine pub; or just eating a picnic in the Stadtpark, listening to an orchestra play Strauss waltzes. One or two weeks in a personally selected, private apartment in Vienna. Local information, plus our own Untouring Vienna guidebook, researched and written by Untours staff, full of the best restaurants, sightseeing, and other suggestions. An Untours sponsored event, like a dinner with our staff person or a guided trip to Vienna's countryside. 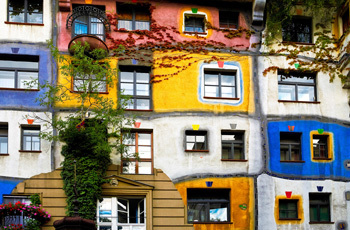 A tour of Vienna Art & History, May 19 & Sept 29.